Rae Carson's Walk On Earth A Stranger begins in 1849 in Dahlonega, Georgia. The protagonist, 15-year-old Leah Westfall and her parents are living on a plot of land her father got through a land lottery. Leah's dad, Rueben Westfall, his brother, Hiram, and the woman who would become Leah's mom are originally from Boston. The three were friends there and moved to Georgia for its gold rush in 1829. Let's step out of the book to ask a question: what do you (reader) know about that lottery? As a Native woman and professor who taught American Indian Studies courses at the University of Illinois, I know a lot about Native history. I know about that lottery. For decades before Georgia held that land lottery in 1832, the Cherokee Nation fought with the State of Georgia and its citizens who had been encroaching on Cherokee land. The Cherokee Nation went before the Supreme Court where it was decided, in 1832 (yes, same year as that lottery) that the Cherokee Nation was a sovereign nation and that Georgia and its citizens had no standing or claim on that land. President Jackson, however, defied the Supreme Court and ordered the removal of the Cherokee people. At the Cherokee Nation's website, you can read some of the history. Forced removal started in 1838. Leah would have been a little girl when that forced removal started. As a little girl, she was likely unaware of Removal and unaware of what that lottery meant to Cherokee people. For her, it is her daddy's land. Someone else in Walk On Earth A Stranger, however, knows about removal, first hand. Leah's potential love interest is a guy named Jefferson McCauley. His father is an Irish prospector who drinks and beats Jefferson. His mother? She's Cherokee, but in 1839 (removal, remember), she fled Dahlonega with her brothers and left Jefferson behind. He remembers her and a Cherokee story she told him, too, that is significant to how Jefferson thinks about himself. The story Jefferson tells is about eight boys who are brothers. Angry at their mother, they run away from her, and leap into the sky. She grabs one, bringing him back to earth. The seven brothers who got away become the Ani'tsutsa (Pleiades). Jefferson imagines he is the brother who was pulled down, that he stayed, and that he has something like brothers out there somewhere, and that he'll find them someday. When he leaves Dahlonga (Leah and Jefferson will soon be headed to California for the gold rush), he feels that he's done wrong, because he is supposed to stay. The story Jefferson tells, however, isn't like the one the Cherokees actually tell. The way they tell it, the boys that run away are not brothers, and the one that is pulled to earth strikes the earth so hard that it swallows him. He's gone, too. His mother sheds tears on that site and eventually, a tree sprouts. It becomes the pine tree. Quite different from the story Jefferson tells, isn't it! Regular readers of AICL know that I object to writers using/twisting Native stories to fit the story they want to tell. 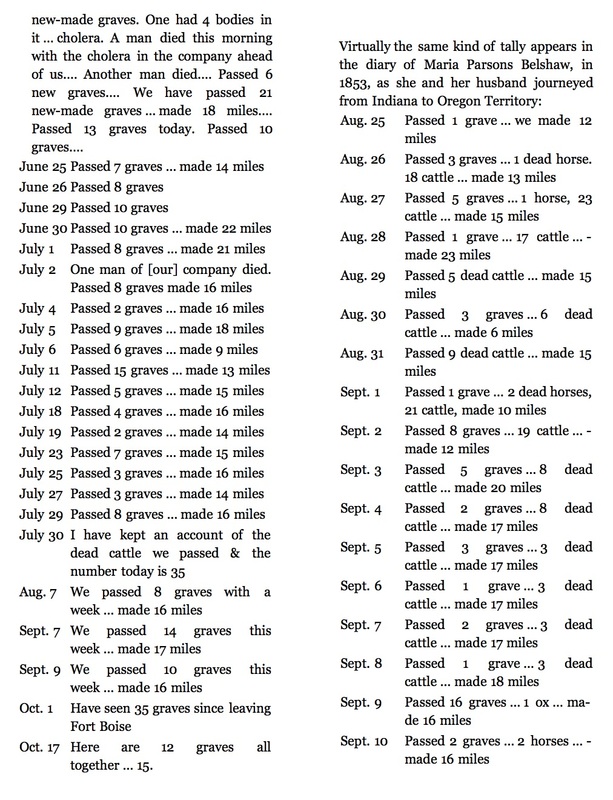 In the Author's Note, Carson lists sources for the emigrant stories she used to create Walk On Earth A Stranger. She obviously found the Ani'tsutsa story somewhere, but doesn't tell us where. She doesn't list any sources specific to the Cherokee Nation, at all, which makes me wonder how she created Jefferson and his voice. Could we say that she didn't need any Cherokee sources because Jefferson is sufficiently assimilated and is no longer Cherokee? Maybe, and yet, he remembers that story and thinks fondly of his mother. As the wagon train crosses the midwest, he never thinks of or expresses an interest in going to find his mother and his uncles. Maybe he's mad at them for leaving him behind. Or maybe he is, as I suggested above, assimilated. That would explain why he is headed west to be a prospector, just like all the other people who did that. Certainly, it is plausible that a Native person would want to do that, but I find it unsettling to create a Native character--who lost his mother because of gold--wanting to head West to be a gold prospector on lands that belonged to other Native peoples. That said, Jefferson looks Native, with black hair and sharp cheekbones. Along the trip west, he is conscious of his Native identity and concerned that people will figure out who he is. People know he's not White but don't know just what he is. Sometimes he is angry when racist men talk about Indians stealing from the wagon trains and kidnapping children, but he keeps that anger to himself. At another point, however, he speaks in a matter of fact way, saying that people are afraid of Indians. Leah is aware of all these incidents and his emotions. She commiserates with him--but sometimes she wonders about Indians, too, and hides those feelings from Jefferson. Because Jefferson is seeking gold, and because his way of speaking/thinking about Indians is inconsistent, we might say he is conflicted about his identity. Or... maybe something else is going on. Maybe he is just a device in the story. What he endures makes it possible for readers to view Leah as a Good White Person, worried for him and his well-being. She does this for other characters, too. "Free Jim" is one. The runaway slave, Hampton, is another. And the bachelors who are headed to San Francisco where they can live as they choose... Native people, Blacks, Gays... I think all are devices by which readers see this girl who gets across the country dressed as a boy, as a Good White Person. Thus far, the problems I've described are familiar ones that occur in depictions of Native people, culture, and history. By that I mean stereotypical and biased storylines that omit key points in history. Carson does something that--for me--is reprehensible. Yes, that is a strong word, but let me explain. People hold two kinds of images of Indians in their head. The noble one (that's Jefferson) and the savage one (that's the ones who steal and kidnap kids). Both are problematic because they shape what people know about us. When writers in children's and young adult literature do it, they're shaping what kids know. They are teaching something to readers. Through their words, writers are, in effect, touching the future (wise words from Christa McAuliffe). They are creating images for their readers. What kind of images of Indians--beyond Jefferson--does Carson give her readers? What did I find reprehensible? The image that Carson adds to what people carry around in their heads is one of Indians as grave robbers. This starts in chapter twenty. By then, Leah/Lee and Jefferson are working for Mr. Joyner. On his wagon are his household goods and his family. Carson has been presenting him as a racist white man. There is, for me, an irony to those words. They're meant to ask readers to pause and question what they know about Indians. But to get there, Carson introduces a new image: Indians who rob graves of Whites. One of Carson's sources is Women's Diaries of the Westward Journey, edited by Lilian Schlissel. In it is the diary of Catherine Haun. She writes of a woman named Martha. On the night of the 4th of July, Haun's wagon train is having a celebration. In the midst of it, Martha and a young child stumble into camp, incoherent and disheveled. The next day, Martha tells them what happened: her husband and sister got cholera. Because of that, the rest of their wagon train left them behind, in their own wagon. Martha's husband and sister died. Martha and her brother were burying her sister when Indians attacked. Martha fled with her little girl. Two days later, Haun's wagon train comes upon Martha's abandoned wagon. They find that her sister's grave is still open and Martha's husband is where they left him, dead, in the wagon. Their clothing is missing and there is no sign of Martha's brother or Martha's little boy. Later on the page, Haun writes that Indians spread smallpox among themselves by digging up bodies for their clothing, and later in Haun's diary, we learn that Martha was reunited with her son. Indians had taken him and traded him for a horse. Hence, in Haun's account, Carson has a source for the grave-robbing Indians she depicts in Walk on Earth a Stranger. But take a look at this page from Schlissel's book. The column on the left is from Cecilia McMillen Adams's diary. On the right is an excerpt from Maria Parson's Belshaw's diary. On the next page (not shown) is the account of Caroline Richardson. On June 1 she wrote "Graves now are often partly dug up." She doesn't say Indians did it. Might she have thought that? We don't know. Angeline Ashley noted 47 graves. Esther Hanna noted 102. Neither Angeline or Esther notes graves that have been dug up. 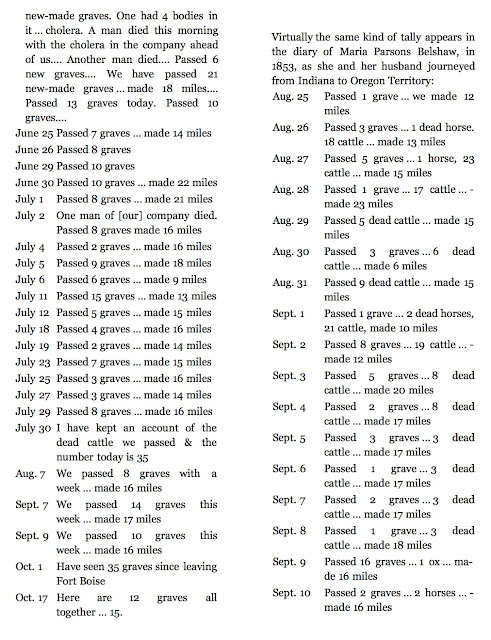 Overwhelmingly, I think Carson's source notes a large number of graves, but ones dug up by Indians? No. Enter, again, my own identity as a Native woman and scholar. Do you know about NAGPRA? That is a law passed in the United States Congress. It is all about graves being robbed. Native graves, that is. For literally hundreds of years, people have been digging up Native graves. Human remains and artifacts, dug up and sold on the black market, or collected and deposited in museums. Through NAGPRA, those remains are being returned to Native Nations for reburial. That sort of thing is still happening. It was in the news just this week. Actors in the film, Maze Runner, were shooting at a Native cemetery. They took artifacts because "who doesn't?" But let's come back to Carson's sources. In the introduction to Women's Diaries of the Westward Journey, Schlissel writes that the letters and diaries in her book are "accounts of singularities" and that only "when the patterns emerge with regularity can one believe the responses are representative" (p. 11). Is Haun's singular account one that ought to be introduced to young readers as Carson has done? In Walk on Earth a Stranger, she introduces that image and leaves it open-ended for her readers to sort out. Therein lies the problem. This image of grave robbing Indians fits what people think they know about Native peoples: primitive, depraved, less than human, savages. Carson doesn't come back to tell us that, in fact, it is not representative of the historical record. Whereas men usually emphasized the danger from the Indians and told of their fights with the native peoples, the women, who admittedly often started out fearful of the Indians, usually ended up finding them friendly in manner and often helpful in deed. Women, it seemed, had no need to emphasize Indian ferocity. Friendly Indians? Helpful Indians? That is the image of Indians women had at the end of their journey. It is not the image of Indians that readers have when Lee and her group get to California. Let's look at another episode Carson provides. "We had a situation here a few weeks ago, where an Indian offered a man three horses in exchange for one of his daughters. The settler joked that if the Indians gave him six, it was a deal. This joke, as it were, at his daughter's expense, nearly led to bloodshed, when the Indian came back with the horses." "followed our wagons for several days and we were glad to get rid of him without any trouble." Quite a different image, isn't it? I assume Carson read through her sources, but why does she give us such a different image of Indian people, given what her sources told her about them? One might argue that Carson is even-handed in depicting racism. Indians rob graves, but what about Mr. Joyner? He puts fear of Indians in his wife's mind again and again. He puts measles infected blankets in a grave so the Indians can get sick when they dig up that grave. Pretty dang racist, right? On one hand, we have grave robbing Indians, and on the other, we have Mr. Joyner and Frank (another White man who is depicted as racist). Notice that Carson gives us Indian people as a group who are horrible, versus specific White individuals who are horrible. Carson effectively tells us to hate Mr. Joyner and Frank as racists, but why did she not individualize those Indians on the trail in some way, guided by her sources? Why does she have that grave robbing part in there? It'd be terrific if she would tell us why. As noted in the title of this post, Rae Carson's Walk On Earth A Stranger is not recommended. Published in 2015 by Greenwillow, it is currently on the long list for the National Book Award. I hope someone shares this review with members of the committee. Carson's book debuted on the New York Times best sellers list. That, I think, is based on her previous work, but I'm sure the publisher's huge marketing campaign helped get it on that best seller list. Today (October 6, 2015), fans of Stephenie Meyer's Twilight saga were ecstatic about her new book Life and Death. In it, she "gender swapped" the characters. Bella is now a guy named Beau. Edward is now a gal named Edythe, and Jacob (the Quileute character) is now a girl named Jules (Julia). Meyer said she was motivated to make the switch because of questions she received at signings about Bella being a "damsel in distress." "It's always bothered me a little bit, because anyone surrounded by superheroes is going to be in distress," Meyers explained. "I thought, 'What if we switched it around a bit and see how a boy does,' and, you know, it's about the same." This is the chapter where we meet Jacob/Jules, the Quileute character who is going to tell Bella/Beau scary stories about the werewolves and "the cold ones" (vampires). A few minutes after Angela left with the hikers, Jacob sauntered over to take her place by my side. He looked fourteen, maybe fifteen, and had long, glossy black hair pulled back with a rubber band at the nape of his neck. His skin was beautiful, silky and russet-colored; his eyes were dark, set deep above the high planes of his cheekbones. A few minutes after Allen left with the hikers, Julie came over to take his place by my side. She looked fourteen, maybe fifteen, and had long, glossy black hair pulled back with a rubber band at the nape of her neck. Her skin was really beautiful, like coppery silk, her dark eyes were wide-set above her high cheekbones, and her lips were curved like a bow. Debbie's thoughts: Jacob sauntering conveys attitude. Julie, on the other hand, walks without attitude. Because... why? I don't know. The descriptions of hair and skin and cheekbones are familiar ones. Not all Native people have long, glossy black hair or high cheekbones but that's generally how we're depicted in children's and young adult books. This is a problem for Native people who do not look that way. People say--without batting an eye--"you don't look Indian." “Well, there are lots of legends, some of them claiming to date back to the Flood— supposedly, the ancient Quileutes tied their canoes to the tops of the tallest trees on the mountain to survive like Noah and the ark.” He smiled, to show me how little stock he put in the histories. “Another legend claims that we descended from wolves— and that the wolves are our brothers still. It’s against tribal law to kill them. “There are lots of legends, some of them claiming to date back to the Great Flood— supposedly, the ancient Quileutes tied their canoes to the tops of the tallest trees on the mountain to survive like Noah and the ark.” She smiled, to show me she wasn’t taking this seriously, either. “Another legend claims that we descended from wolves— and that the wolves are our sisters still. It’s against tribal law to kill them. Debbie's thoughts: That "legend" that Jacob talks about is supposed to be a Quileute one, but it that marks "the Flood" as a touchstone event. If it said "a" great Flood, that would work, but that "the" in there ties this story to Christianity. I've not done any research to see if the Quileute people have a flood story where they tied their canoes to tall trees. Maybe they do. Or, maybe this is something that Meyer made up. Regular readers of AICL know that I find it sacrilegious to twist Native stories to make them fit a narrative that a not-Native writer is telling. Jacob has "little stock" in the stories; Jules doesn't "take this seriously." Is this dismissiveness on Jacob/Jules' part to throw Bella/Beau off track so that Bella/Beau don't know that these stories are real? The way Meyer presents this werewolf part of her story is not like the stories the Quileute's actually tell. As noted above, I think Meyer is twisting a Native story to fit her narrative, and I find that to be deeply disrespectful. (Updating to add this next line.) And as @travelingHeidi pointed out on Twitter, Noah isn't gender swapped! Debbie's thoughts: That is another part of Meyer's book that I find especially problematic because of her use of the word treaty. Readers are asked to believe that Jacob/Jules' great grandfather/mother made a treaty with a coven of vampires. Treaties are made between heads of state. Are we to think of this group of Quileute's and this coven of vampires as nations? After hearing those "scary" stories, Bella/Beau has a nightmare. But Jacob let go of my hand and yelped, suddenly shaking, falling to the dim forest floor. He twitched on the ground as I watched in horror. “Jacob!” I screamed. But he was gone. In his place was a large red-brown wolf with black eyes. The wolf faced away from me, pointing toward the shore, the hair on the back of his shoulders bristling, low growls issuing from between his exposed fangs. And then Jules dropped my hand— she let out a strange yelp and, suddenly shaking, she fell twitching to the ground. I watched in horror, unable to move. “Jules!” I yelled, but she was gone. In her place was a big, red-brown wolf with black eyes. The wolf faced away from me, pointing toward the shore, the hair on the back of her shoulders bristling, low growls issuing from between her exposed fangs. Debbie's thoughts: Here, I direct you to an excellent series of tweets by Jeanne (I don't know her personally but she is one of the people I learn a lot from by reading her tweets and blog posts). One that is especially insightful is this one: "The supernatural world of Twilight is a construct that makes an abusive white man look like a hero and Native American men look like animals." Jacob was already climbing out, his wide grin visible even through the darkness. In the passenger seat was a much older man, a heavyset man with a memorable face— a face that overflowed, the cheeks resting against his shoulders, with creases running through the russet skin like an old leather jacket. And the surprisingly familiar eyes, black eyes that seemed at the same time both too young and too ancient for the broad face they were set in. Jacob’s father, Billy Black. Jules was already climbing out, her wide grin visible even through the darkness. In the passenger seat was a much older woman, an imposing woman with an unusual face— it was stern and stoic, with creases that ran through the russet skin like an old leather jacket. And the surprisingly familiar eyes, set deep under the heavy brows, black eyes that seemed at the same time both too young and too ancient to match the face. Jules’s mother, Bonnie Black. Debbie's thoughts: More of that stereotypical descriptors, this time of elders. Note the word "ancient" in there? That's another word that gets overused. Some overall thoughts: In Life and Death, Meyer just switched a few letters here and there to make the Native characters fit her gender swapping narrative. It is more evidence that she is clueless regarding Native peoples and cultures. In fact, her gender swapping of Native content strikes me as similar to all the people--male or female--who put on a headdress that is generally used only by men. It is superficial and adds a new layer of disrespect to what she's already done with the Twilight saga prior to today's release of Life and Death. I opened this post noting that people are very excited by Life and Death. Much of that excitement is because Twilight is credited with having launched young adult literature. That is something people who care about young adult literature can certainly applaud, but we must not lose sight of the problems in the series. There are plenty of young adult books out there that can counter the misogyny in these books. We cannot say the same thing about books to counter the misrepresentation of Native people. Indeed, Meyer's book also launched a slew of books that do precisely what she did: stereotype, misrepresent, appropriate. Meyer acknowledged concerns over the "damsel in distress" but the concerns over misrepresentation of Native peoples are just as important. See previous AICL posts on Meyer's saga. Meyer, Stephenie (2015-10-06). Twilight Tenth Anniversary/Life and Death Dual Edition, Little, Brown Books for Young Readers. Kindle Edition. 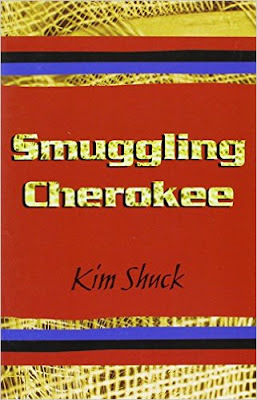 Editor's Note: Beverly Slapin's review of Smuggling Cherokee may not be used elsewhere without her written permission. All rights reserved. Copyright 2015. Slapin is currently the publisher/editor of De Colores: The Raza Experience in Books for Children. Into my great-great grandfather’s chest to kill clean. Wield it against others with equal skill. Will the boarding school officer come up? Because of her crippled leg. For baskets that took a year each to make. 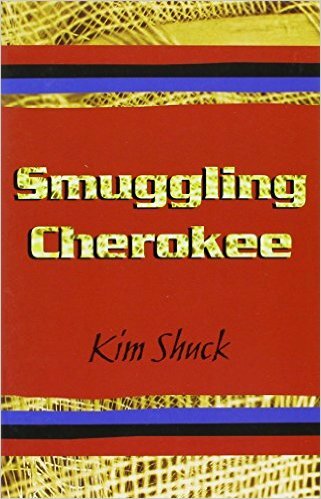 Smuggling Cherokee, as with all of Kim Shuck’s poems, will resonate with Indian middle and high school readers. Students who are not Indian may not “get” some of them the first time around, but they will, eventually, if given the space to sit with them. Eds. note: Kim Shuck wrote to say that she is an enrolled with the Cherokee Nation of Oklahoma. The error is in that last line that reads "Christopher Columbus had discovered a new world." Maybe you think that the sentence before it makes it ok because it tells readers that no one in Europe knew about this land. It doesn't make it ok. Later, you tell readers he discovered an island he named Dominica. And that he also "discovered the Virgin Islands and Puerto Rico" (p. 72-73 in Kindle version). Simply put, you can't discover something that someone else already had. With this book, you're misleading children. You're mis-educating them. 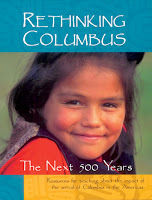 Your Who Was Christopher Columbus is loaded with other problems, too. My suggestion? Withdraw it from publication. My suggestion to all the people who already bought Bader's Who Was Christopher Columbus? Do not use it with young children. Instead, write to Penguin and ask for your money back, or, use it with older children and adults in a text analysis activity. Read what Bader wrote, and compare it to other sources. A great set of resources for this activity is at the Zinn Education Project website. Another excellent resource is Rethinking Columbus. You, Ms. Bader, and your editors at Grosset & Dunlap (it is an imprint of Penguin), can do better. I hope you do. Recall the book. Refund the money parents, teachers, and librarians spent on it, too.